Last Friday Trent brought one of O.K. 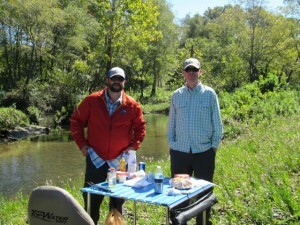 Foods, Inc., customers, Brad Sanders, the CEO of Raising Canes Chicken to the Little Red River for a day of fly fishing. 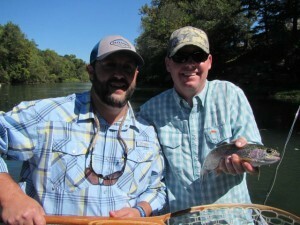 Brad is a very accomplished fly fisherman and has done a lot of fly fishing in his travels. 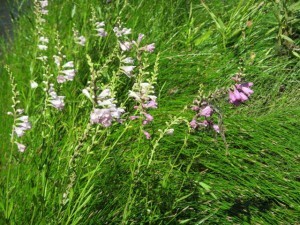 We had a beautiful fall day and the wild flowers along the river banks are in all their glory as the trees are just beginning to show a small hint of the fall color change. We started the day with streamer rods for about the first hour but the fish did not respond to several different streamer patterns. We did not waste a lot of fishing time and quickly changed up to some nymph rigs. Both Trent and Brad caught a bunch of nice Rainbows on a variety of flys including #14 Norfork Specials, RG/PT Cruisers, Born’s Hairy Legged Sowbugs and the top fly of the day, a #14 Chronic. At lunch Bo fired up the grill and what else, a great chicken lunch on the river. The guys all talked a little business and compared some fly fishing travel notes. 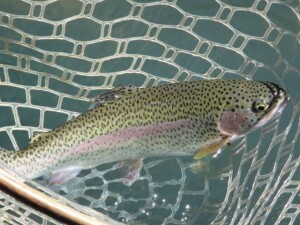 Then it was back on the water and good afternoon of Rainbow action. It was a wonderful day on the river and we look forward to having Brad back on the Little Red River real soon. Oh yeah, Raising Cane’s chicken tenders are the very best so be sure to visit one of their restaurants. There is a brand new one now in Fayetteville, Arkansas, with more to come.